How to make money from rising oil prices by buying three less-obvious stocks. With the price of oil hovering around $75, it's a good idea to start thinking about buying stocks exposed to rising capital spending from the oil and gas industry. While the usual suspects are oilfield services companies, there's also a number of industrial equipment companies with significant oil exposure. Let's take a look at them and why they are good ways to play the investing theme of higher oil prices. Not only is Emerson Electric (NYSE:EMR) continuing to generate mid-single-digit underlying growth in its commercial and residential solutions business (44% of third-quarter segment earnings comprising climate technologies and tools and home products), but it's seeing a strong cyclical recovery in its core automation solutions segment. As you can see below, the company's overall sales growth has bounced strongly from the dark days of the 2015–2016 U.S. industrial recession -- a downturn largely caused by a slump in energy and mining commodity prices impacting heavy industries in the U.S.
Data source: Emerson Electric presentations. Year-on-year growth. Chart by author. Emerson has heavy exposure to process automation (oil and gas processing, chemical processing, etc.) in its automation solutions segment, and a recovery in spending is being driven by higher oil prices. Moreover, the good news from the company's latest Securities and Exchange Commission (SEC) filing on order growth suggests more growth to come. According to the filing, Emerson's automation solutions underlying orders increased 8% in the trailing three months to August, with commercial and residential solutions underlying orders up 4% in the same period. It's a safe bet that if oil prices stay around $75 or above, Emerson is likely to see continued order and sales growth in the future. And with CEO David Farr adding digital solutions to Emerson's portfolio by making opportunistic acquisitions, the company is well positioned for growth. You could be forgiven for not having heard of Apergy Corporation (NYSE:APY), because it's only been a listed company since the end of April. The company was spun off from Dover Corp. and comprises a collection of the former Dover's upstream oil and gas businesses. Apergy's artificial lift and drilling technologies are almost entirely sold into the onshore rig market, and as you can see in the chart below, the onshore rig count -- the key metric to follow for Apergy's solutions -- has recovered notably better than the offshore rig count in the last five years. 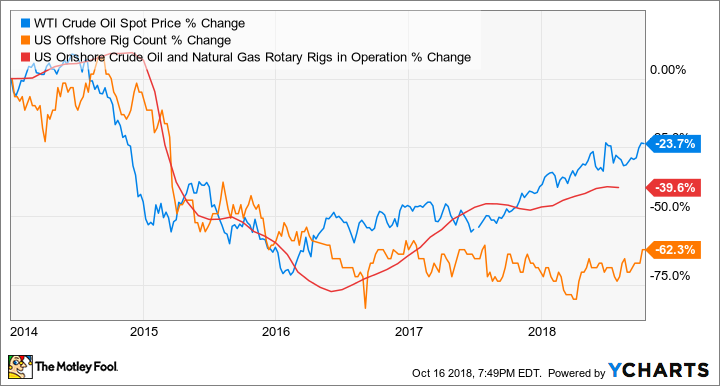 The point is that the current price of oil has induced a recovery in onshore activity, and the benefits are being seen in Apergy's sales and earnings. The company's second-quarter earnings saw a 19% increase in year-on-year revenue accompanied by a 33% increase in earnings before interest, tax, depreciation, and amortization. Provided oil prices can stay at or exceed current levels, Apergy is likely to see earnings improvement. Flowserve Corporation's (NYSE:FLS) engineered and industrial pumps, seals, and valves make it the very definition of a company with exposure to heavy industries. Oil and gas, chemicals, and power currently account for 36%, 22%, and 12%, respectively, of its bookings. As such, the company's original equipment (OE) got hit by the U.S. industrial recession in 2015–2016. No matter; Flowserve currently garners around half of its sales from aftermarket sales, which are relatively stronger in a downturn. Moreover, the increase in oil prices and capital investment in chemicals -- as seen in Emerson's order trends above -- means Flowserve management has cause for optimism. Indeed, as CEO Scott Rowe pointed out on the company's second-quarter earnings call, "we continue to believe the cycle has reversed course after a multiyear downturn, and we are optimistic that our markets will continue to strengthen." Recent numbers serve to back up Rowe's optimism. For example, second-quarter OE sales increased 7.9% year on year in constant currency, with aftermarket sales up 10.2% on the same basis. Overall bookings were up 6.8%, with strength in oil and gas (up 12%) and chemicals (up 13%) offset by weakness in power (down 7%). Moreover, thanks to a combination of improving end markets and management's so-called transformational initiatives, Wall Street analysts expect earnings to grow at a 25% rate in 2018 and 2019. If you believe that the current trend of rising oil prices is sustainable and/or you are looking to balance your portfolio by buying stocks that benefit from energy price increases, then all three are attractive. Flowserve is recovering from a difficult period, and management still has work to do, so it offers a turnaround story to boot. Emerson Electric probably has the highest quality of earnings and represents a relatively safe way to play the theme. Meanwhile, Apergy has the biggest exposure to rising energy prices. There's something for every investor in these three companies.